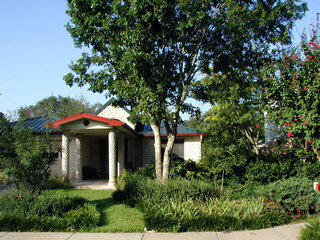 This property is a modest home in a residential neighborhood which backs up to wild land in a creek bed. 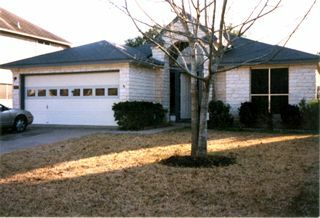 Patricia has been fortunate to be able to work with the homeowner over several years to realize her vision. Typical foundation hedge plants and one interesting tree with a split trunk on a standard lawn. Patricia removed all the lawn except a path. 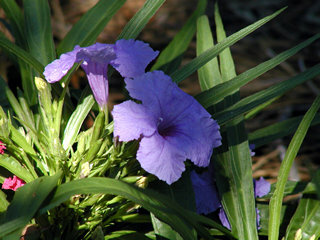 Native and adapted evergreen and blooming plants form islands of texture and color. The new porch provides a more welcoming covered entry. 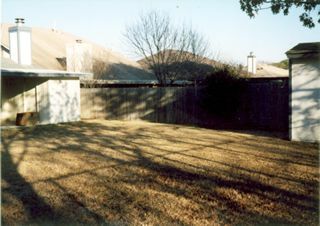 The back yard, too, was basically one big lawn. 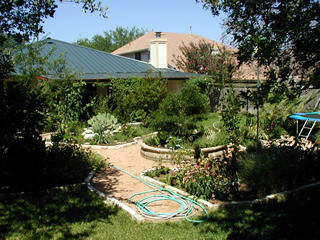 A circular garden is the centerpiece of the back yard now, with curved footpaths and keyhole gardens throughout. The beds are full of herbs and flowers. Visible to the right is a trampoline, a favorite of neighborhood children. Looking toward the creek. The previous owner had fenced the lawn off from the wild land. 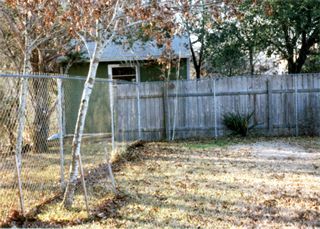 Patricia removed the fence, opening the backyard onto the creek. 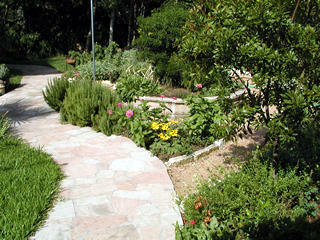 This stone footpath past the circular garden leads to stairs descending into the creek bed. 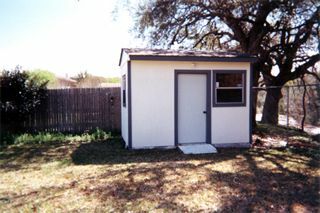 This storage shed was cramped and difficult to use because the door swung inward, using up lots of interior space. 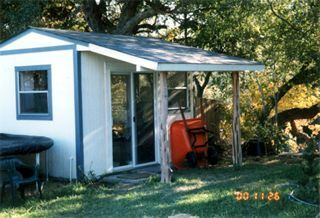 Patricia installed sliding doors and a porch, making the space much more attractive and usable. Topographical map. 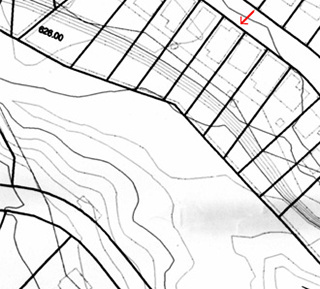 The red arrow points to the subject property. The rear of the property descends rapidly to a broad creekbed, including a natural stone pavement and islands of trees and brush. 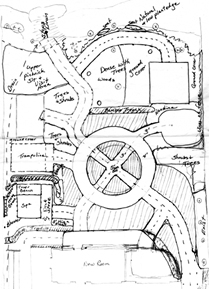 One of Patricia's design sketches for the back yard. The final result does not match this exactly, but the main shapes and contours are preserved. 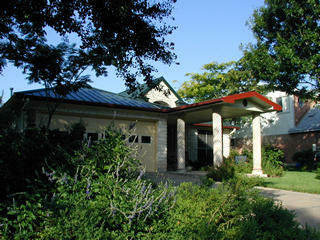 Another view of the new front porch. 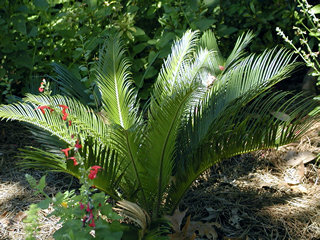 Front yard detail: Katie's Aralia. 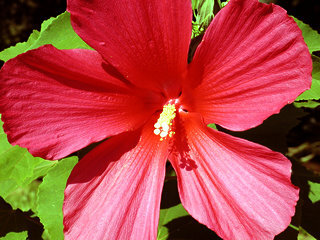 Back yard detail: hibiscus flower in summer. View from the creek. 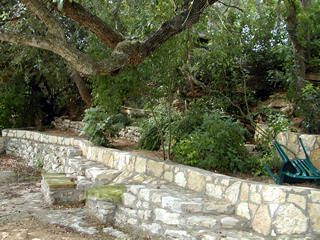 Patricia installed stonework to protect the creek bank. The back yard is up the bank to the right. 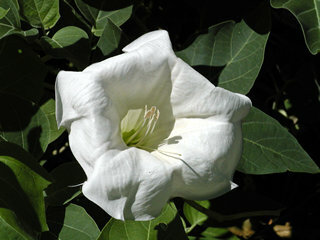 Datura provides night-blooming aromatic flowers outside the bedroom in summer. The landscape has a definite sub-tropical feeling.